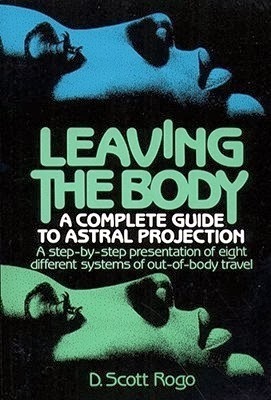 D. Scott Rogo's book Leaving the Body: A Complete Guide to Astral Projection is an oldie-but-goodie from the 1980s. It's been almost 30 years since I first read it, so I decided to re-read it and post a review. D. Scott Rogo was a parapsychologist who wrote a few books on out-of-body experiences. He was also an experiencer, so unlike many in his field, he believed there actually is a non-physical component to OBEs. When I first read this book, it was the most practical, straightforward and no-nonsense book in the entire genre. That's not saying much, because there were so few books on the subject at the time. Now that the playing field is level, and there are lots of OBE books on the market, I can honestly say: even today, very few books can top this one for providing practical techniques for inducing the out-of-body experience. The first method, dynamic concentration, basically talks about the importance of impressing the subconscious and putting the subconscious will into action. This was a popular technique of Dr. Charles Lancelin, Sylvan Muldoon, and other occulists of the early twentieth century. Basically, you use these techniques to impress on your subconscious the desire to have OBEs. The second method, progressive muscular relaxation, is more of a passive technique. Many OBE authors (myself and Robert Monroe included) stress the need for complete relaxation as a prerequisite to OBEs. Sometimes that's all you need for an OBE. Rogo describes this in detail. The third method, dietary control, addresses the subject of restricting your diet. This is something many OBE books do not address, and or at least not adequately. The rare exception is Graham Nicholls, who addresses the subject very well in his book Navigating the Out of Body Experience. The fourth method is a grab-bag of breathing techniques and yogic techniques. Again, this subject is rarely talked about in other OBE books. Dr. Robert Crookall gave a fair amount of attention to breathing techniques, and even devoted an entire book to the subject. The fifth is the procedure Robert Monroe described in his first book, Journeys Out of the Body. It's the technique that gave me my first vibrations. The sixth method, visualization techniques, is where most of the OBE literature spends its time. Rogo treats the subject fairly. The seventh method, changing lucid dreams into OBEs is another method used by some of the occultists like Hugh Calloway (aka "Oliver Fox") in his book Astral Projection and others. The last method Rogo covers is projection through guided imagery. Rogo gives most of the credit to Sandor Brent, although this is also described by few other books (although at the moment they escape me). Basically, this is when a facilitator does a guided meditation in order to induce OBEs. There are also chapters dedicated to the potential of OBEs and its practical applications. It's also chock full of tidbits of OBE history, which I find fun and fascinating. For people who want to induce their own OBEs, but having trouble getting there, this is a must-have book. The information is concise, straightforward and no-nonsense. Yes, it's old and outdated, but it's mostly just OBE techniques, and the information is solid. Thumbs way up on this one.